The Mitsubishi iMiev is a highway capable, compact electric car that will get have a 75-100 mile ev range and a top speed of 80mph. 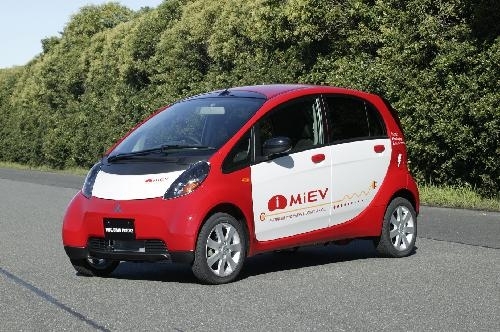 It is uncertain if the iMiev will reach the US, but it is expected to be released for commercial sale in Japan by 2009. Test fleets are already on the road in Japan and will soon hit the streets of Iceland. Nearly all of Icelands power comes from geothermal and hydro power; electric cars are the logical next step in being emission free and energy independant. The iMiev is expected to be priced at around $37,000. Should the car ever reach the US, I would expect it to be successful in urban areas and among the well endowed environmentally conscious. The car shares very similar ev performance and price range as the GM EV1, a car that was leased in California over ten years ago. I don’t see why recent technological advances are not translating to higher ev ranges than 75 miles.